For some people, ‘May the fourth be with you’ is just a strange play on words for a date at the start of the month of May. 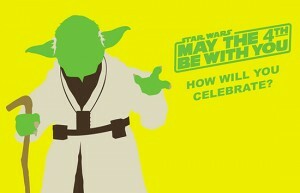 For others, ‘May the fourth be with you‘ means so much more. It is actually considered to be a holiday by Star Wars fans across the globe, created on this date to coincide with the popular phrase ‘May the force be with you’ which appears in the time honoured films. There are many websites created by fans with more information about the classic Star Wars films. Check out these ones – some have interactive games on them too! There are even special public events being held at various locations on 4th May – here is one in London which our local firework customers might enjoy. Check out what some superfans will be getting up to this weekend in the USA! Here at Fireworks Den, we think ‘May the fourth be with you’ is the perfect opportunity to launch some amazing fireworks into the night sky in celebration of the Star Wars culture. Here are some of our space related picks! 2) Space Probe: A fabulously colourful single ignition which will certainly light up the night sky! 3) Starburst: A noisy one! Get heard right up in space! 4) Thundering Space Spiders: Great value for money here with so many effects. 6) Titan Rocket: Since rockets look a little like a light sabre, it only seems right to suggest one of our favourite large rockets here! Whichever fireworks you choose to buy from Fireworks Den for this weekend, be safe, have fun, and MAY THE FOURTH BE WITH YOU !!! This entry was posted in May the Fourth be with you on May 2, 2013 by Becky.